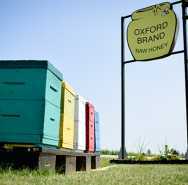 In the summer months Oxford Honey and Supplies opens their Observatory on Saturdays to allow guests a closer look at an active hive. Get an upclose look to the buzzing bees and maybe even see the Queen! Visit our website for more information.